Screw air compressors deliver large amount of air without the need of reservoir tank compared to reciprocating compressors of the same size. Screw type compressors can operate at 100% duty cycle. They can continuously operate without stopping to prevent overheating at a given time. Rotary screw air compressors last longer. A rotary screw compressor is designed so that the compressor oil seals the internal rotors, preventing parts from wearing out therefore it can maintain the same performance throughout its long life. Rotary screw air compressors are lighter weight and provide more capacity in a smaller package. The rotary screw compressor will provide enough power to operate most common hand-held pneumatic tools. From impact wrenches and deburring tools to grinders, you’ll get the air to power these tools when you need it. Rotary screw Air Compressor or screw compressor uses a rotary type positive displacement mechanism. It replaces piston compressors where large volume of high-pressure air is needed, a screw compressor is better for large industrial applications or to operate high power air tools such as jackhammers and an Industrial screw compressor has a much longer life than piston types. How do screw compressors work? A screw air compressor has two interlocking helical rotors contained in a housing. Air comes in through the screw compressor valve, “the screw compressor inlet valve” and is taken into the space between the rotors. As the screw air compressors screws turn, they reduce the volume of the air, thus increasing the pressure. What is a screw air compressor? Basicly a screw compressor has a male and female rotors are turning in opposite directions they draw air in between them. As they rotate the space between the rotors decreases, creating compressed air. They are the most widely used air compressor models in the industrial marketplace and screw compressor is designed to run 24 hours a day, 7 days a week, for many years! Screw compressors are a lot more expensive than the piston type, so what sort of life will you get to make the price worth it? it's estimated that a rotary compressor will last for 40,000 to 60,000 hours the equivalent of full-time operation for 20 to 30 years. With regular maintenance, piston type compressors have a life expectancy of 10 to 15 years so with the screw type you can expect about twice the life span. 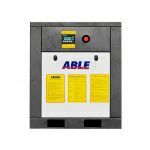 Is your conventional air compressor struggling with the demands placed on it? If you need larger volumes to power your pneumatic tools, a silent screw air compressor is the machine for you. The metal age is the start of air compression with the invention of the bellows, then with the invention of the vacuum pump in the year 1650, German physicist and engineer, Otto Von Guericke is responsible for this invention. Von Guericke used his vacuum pump to experiment with air pressure and demonstrate how air worked with combustion. This led the way for the future of compressed air. In 1762, English engineer John Smeaton invented a blowing cylinder that was driven by a water wheel. In 1776, English industrialist John Wilkinson installed a blasting engine in his machine shop that could produce 14.5 pounds of air pressure per square inch. In 1829, a compound air compressor was patented. In 1872, the compressor was improved with the use of water jets that cooled the cylinders. This greatly improved the systems efficiency, and in turn, emphasised the importance of controlling the temperature and moisture of the air that is being compressed. 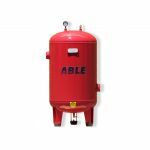 "The screw compressor was first developed to meet the needs of the construction and mining industries. The first screw compressor was actually made in the 1930’s. The Industrial or rotary screw compressor is actually the same thing as the screw compressor and is widely used for many different applications. "I am really impressed with the 3000 PSI pressure washer. I spent around 5 or 6 hours today..."